The presiding deity, Lord Venkateswara is famous temples in Andhra Pradesh as well as all over the world as the giver of boons, and is paid homage’s by people from all religions and races. Nestled cosily among seven hills of the Eastern Ghats, Tirupati is the destination divine for the pilgrims in search of God. It is located in Chittaur District, 572 km from Hyderabad, 240 km from Bangalore, 130 km from Chennai. The sublime seven hills of Lord Venkateswara beckon you to a stimulating experience in the divine destination of Tirupati. Picturesque locations, gorgeous valleys, ancient temples, and enthralling historic places. You will be awe-struck by the sparkle of the exquisitely carved Golden gopuram of this ancient Dravidian temple of Lord Venkateswara, giver of boons, the riches of all deities. His two consorts – Alamelumanga and Padmavati, flank him. You can also take part in the annual Brahmotsavams – a virtual convergence of devotion. Take the path up by foot or by bus the winding way up will leave you gaping at the enchanting scene. The premises of the temple and the sanctum sanctorum will lure you back again and again. Air: Tirupati is well connected by air to Chennai and Hyderabad. Rail: Connected to all major cities of India. Chennai is main railhead and nearest railway station is Tirupati. Note: The train timings and fares are updated regularly on this site. However, please do cross-check with the Railways. Road: Tirupati is well connected to Bangalore, Chennai, Chittaur, Hyderabad, and Vijayawada. Lord Venkateswara Temple: Nestled among high Eastern Ghats, Tirumala can be reached only after covering the range of hills. 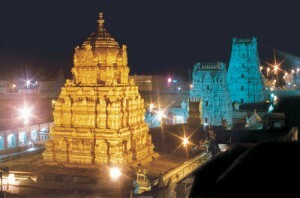 The presiding deity Lord Venkateswara is also referred to as Lord of the Seven Hills. Patronized by Pallavas, Pandyas, Cholas, Vijayanagar kings and later by the king of Mysore, the temple finds a mention in the Sastras and Pruanas. The main temple is a magnificent example of the fine Indian temple architecture. Both the Vimana over the sanctum sanctorum and the Dhwajasthambam (the temple flag-post) are plated with gold. Swami Pushkarini: A sacred tank adjacent to the Balaji temple, a dip here is considered a custom before entering the temple. According to legend, Swami Pushkarini was a pleasure tank of Lord Vishnu in Vaikuntam and brought to earth by Garuda for the sport of Lord Venkateswara. Akasa Ganga: Located about 3 km north of the main temple, the water flows throughout the year. Sila Thoranam: Situated on Tirumala, this is a rare geographical arch and the only one of its kind in the whole of Asia. Two other such arches are known to exist in the world – the Rainbow Arch of Utah in US and the Arch of “Cut Through” of UK. This is one of the rarest ‘geological faults’ of India and geologists compute the age of arch as 1500 million years. This is also a rare geological feature called ‘eparch an unconformity.’ This natural arch is believed to have formed due to intensified weathering and erosion of stream action and has withstood the torque of nature. The length of this arch is 25 feet and the height 10 feet. Kanipakam: The present Ganesha temple was constructed in the 11th century by king Kullottunga of the Chola dynasty and further develops in 1336 by the kings of Vijayanagar. One peculiarity of the idol is that it eternally grows in size. To testify the fact that the Lord is growing in size. To testify the fact that the Lord is growing, the Silver “Kavacham” that was made 50 years ago in now too small for the idol. Kapila: Lord Shiva is said to have appeared before the Saint Kapila in this historic site. The cascading waterfalls from the holy hills are a treat to the eyes. Narayanavanam: This famous garden is believed to be the venue of the sacred marriage between Lord Venkateswara and Goddess Padmavati. Sri Venkateswara Sanctuary: Sprawling over 506 km of greenery’s Venkateswara Sanctuary and National Park at Tirupati are an adventure’s delight. The rich wildlife provides a perfect and a great sight. Kailasanathakona: This perennial waterfall located in the Nagari valley near Tirupati in Chittoor district originates from a fracture in a sheet rock. The water is clear and is considered sacred. Said to be of substantial mineral value, the water is believed to have curative powers. Talakona: This waterfall is considered the threshold of the Hills of Tirumala on which the shrine of Lord Venkateswara is located. Nestled in lush forests, the 60-metre fall is a perennial one and standing under the cascade is said to cleanse the mind and body, Local transport can be engaged from Tirupati to reach there. Kanipakam: The Kanipakam temple of Lord Ganesha near Tirupati was constructed in the 11th century. The idol of the deity here is believed to be eternally growing in size and the silver ‘Kavacham’ that was made fifty years ago has become too small to adorn the deity now. Kailasanatha Kona: This perennial waterfall located in the Nagari valley near Tirupati in Chittoor district originates from a fracture in a sheet rock. The water is clear and is considered sacred. Said to be of substantial mineral values, the water is believed to have curative powers. Sri Venkateswara Sanctuary & national park: It is situated about 10 km from Tripati. This sanctuary is located at Chittoor and Cudaapah districts. Its area is 506 Sq. km. Dry deciduous mixed forests with patches of moist deciduous; forests in the valleys. Some of the rare and endemic plant species like Red Sanders. Goddess Alamelumanga Temple: The temple of Goddess Alamelumanga, the divine consort of Lord Venkateswara, is at Tiruchanur near Tirupati. One more temple is dedicated to the Goddess at Srinivasa Mangapuram, 12 km from Tirupati. Chandragiri: The last capital of the Vijayanagar kings was Chandragiri on the banks of the River Swarnamukhi in Chittoor district. Ruins of the fort exist to this day and amidst them stand the Raja Mahal and Ranbi Mahal palaces that have been given a facelift and beautified. The fort atop a huge rock that stands 56 metres tall is just 12 km from the temple town of Tirupati. AP Tourism has put together a unique “son-el-lumiere” at Chandragiri to relive the glory of the Vijayanagar Empire. After a hectic trip to temples and shrines in and around Tirupati, it is time for the much-needed relaxation at Chandragiri, a perfect way to round off the day. Srikalahasti: From among the legends lying behind temples, one of the strangest is from Srikalahasti, 36 km from the temple town of Tirupati. There is a temple of Shiva in the form of a Vayu Linga and the legend behind it is that the deity was worshipped by a spider (Sri) that spun a web over it, while a snake (Kala) placed a gem atop the ling and an elephant (Hasti) washed the ling with water. The temple lies o the banks of the River Swarnamukhi in a valley,. There are frequent buses to Srikalahasti. Horsley Hills: One of the best-known hill resorts in Andhra Pradesh, the place is named after a British collector of Cuddapah district who located the spot and constructed a summer retreat there. Tucked away in the hill ranges near Madanapalle in Chittoor district at an altitude of 1265 metres, it has a cool climate throughout the year. This entry was posted in Andhra Pradesh, Tirupati and tagged about tirupati, andhra tourism tirupati, ap tourism tirupati, chennai tirupati tour, chennai to tirupati, famous temples in andhra pradesh, how to reach tirupati, how to reach tirupati balaji, map of tirupati, places around tirupati, places near tirupati, places to stay in tirupati, places to visit around tirupati, places to visit in tirumala, places to visit near tirupati, places to visit tirupati, tamilnadu tourism tirupati, temperature in tirupati, temples in tirupati, temples near tirupati, tirupati andhra pradesh, tirupati balaji darshan, tirupati balaji temple, tirupati city, tirupati climate, tirupati darshan, tirupati hills, tirupati india, tirupati information, tirupati sightseeing, tirupati sightseeing places, tirupati tample, tirupati temple, tirupati temples, tirupati tirumala temple, tirupati tourism, tirupati travel package, tirupati trip, tirupati visiting places, tourist places near tirupati, trip to tirupati, weather in tirupati, where is tirupati, where to stay in tirupati. Bookmark the permalink.